How are advances in artificial intelligence and machine learning changing credit risk assessment? That’s a topic I’ll be exploring in three presentations at FICO World 2018, April 16-19 in Miami Beach. These three presentations have a common thread: How FICO applies artificial intelligence and machine learning not as a “silver bullet” but carefully balanced with human domain expertise in the formulation of problems and models. Applying Machine Learning to Challenge the FICO Score: What Have We Learned? FICO® Scores are among the most scrutinized models in the world, so would you expect modern machine learning — with its challenges around explainability — to bring great benefits to FICO® Score R&D and production? On Tuesday, April 17, 1:30-2:30, my colleague Ethan Dornhelm and I will show that machine learning offers tremendous efficiencies for research “in the lab”. But in order to bring these efficiencies to the field in the form of a new international FICO® Score, we benefitted from blending the latest machine learning algorithms with FICO’s own explainable and palatable Scorecard development technology. Join us to see how we did it and how the FICO® Score compares against “purist” ML models! Regulators in the UK require that account management decisions need to be forward-looking, by factoring in customers’ abilities to absorb additional debt. In situations where detailed information on incomes and spending isn’t available, how else can we judge affordability? We reformulated this problem as a what-if question: For whom would increasing balances cause financial distress? We conducted an observational study into cause-and-effect for which we leveraged credit bureau data and AI algorithms to identify customers who would have a significant change in their default likelihood if they had a sizeable increase in their total credit card balances. This led to a new scorecard and index that rank-orders affordability risk and complements traditional credit risk scores. Join me at this session on Thursday, April 19, 10:15-11:15. The FICO® Scores is a robust rank-ordering analytic, and that rank-ordering remains strong across economic downturns and upswings. But what can we learn from shifts in the odds-to-score relationships through the economic cycle? To unlock insights into individuals’ sensitivities to economic downturns, we applied machine learing to multi-year credit bureau data, comparing and contrasting payment behaviors from a normal economic period versus a recessionary period. We constructed a new Economic Sensitivity Index which could be valuable both for credit decisions and for provisioning. See how we constructed the problem and our empirical findings in my session with my colleague George Shand on Thursday, April 19, 9:00-10:00. 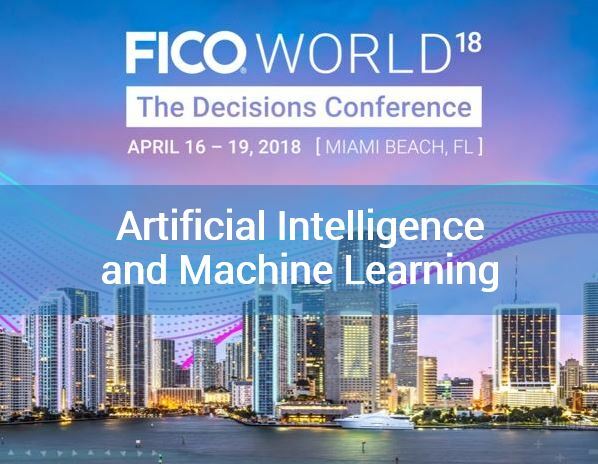 I hope to see you at FICO World 2018, where artificial intelligence and machine learning will be part of many presentations, not just mine!